Spaghetti Carbonara is pasta’s in your face answer to breakfast for dinner. Spaghetti harnesses the power of an egg and creates something magical. And when that egg is cooked Momofuku style, the magic is kicked up to an unforgettable level. Behold the drama of the Momofuku 45 minute egg. Bacon, pasta, parmesan and eggs come together magically to create a creamy, lick the bowl clean dish. 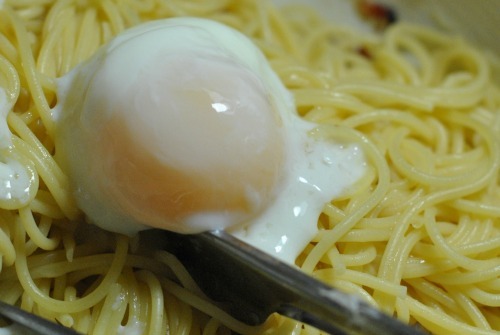 Traditionally, the eggs are cooked by the steam of the hot pasta. 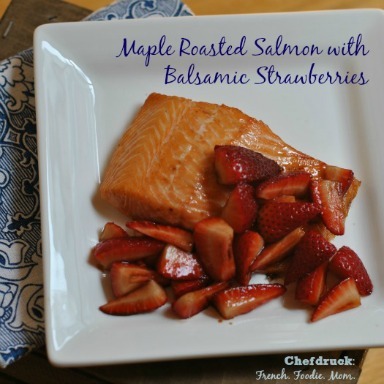 Timing is everything when throwing together this easy dish. The piping hot pasta cooks the eggs as you toss them vigorously, creating a creamy dish without any heavy cream. But if your timing is off, if your toss is a little lethargic, or if your eggs are not at room temperature, then you could easily end up with bacon, pasta, and scrambled eggs. 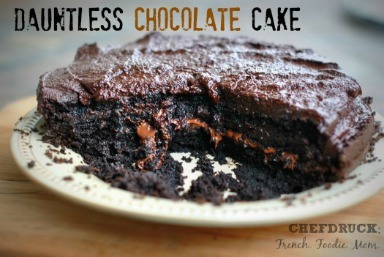 Still tasty, but definitely closer than you’d like to the reality of breakfast for dinner. Spaghetti Carbonara: Bacon, Eggs, Cheese, and Pasta. Heaven in a bowl. To make spaghetti carbonara fool-proof, you need to have everything prepped and ready to go before you start cooking and once the wheels are in motion, all the chaos of family life must be ignored until the creamy and steamy pasta is on the table, and the raw eggs have magically turned into creamy sauce. If your chaos, like mine, can be difficult to ignore, there’s another solution to make amazing spaghetti carbonara every time: the Momofuku 45 minute egg. Turning an easy, throw it together weeknight pasta dish into a 45 minute production seems a little absurd, I know, but the Momofuku 45 minute egg is a pretty neat science experiment and a wild and crazy foodie thrill. It also happens to be delicious and once you’ve made it, you’ll want to add it to soups, plop it in egg sandwiches, or just make it for friends as a party trick. I had heard about this mystical egg for years, and finally got to try it during my recent trip to Toronto to be with my father in the hospital. Momofuku recently opened in Toronto and is my dad’s favorite restaurant. It seemed a fitting way to honor him by ordering a few bowls of steaming soup and pillowy pork belly pancakes while telling stories about him, looking forward to a future Momofuku lunch, with my dad at the table. The egg was bobbing in a bowl of ramen noodles, vaguely threatening and mysterious, until one poke of the chopsticks made it explode, coloring the bowl with a riot of color and flavor: egg fireworks in my bowl. 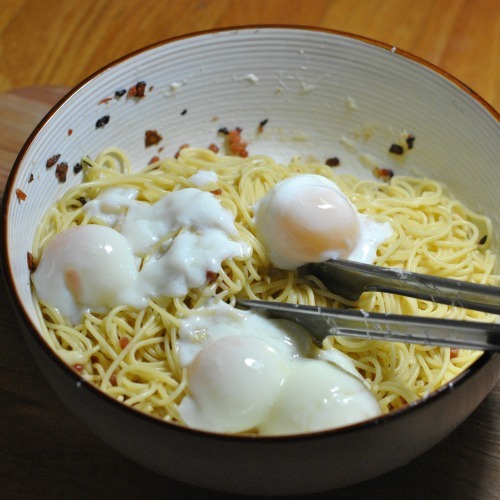 Using a 45 minute egg takes out all the stress of tossing spaghetti carbonara as quickly as possible. I had only been home for a few hours when I took my Sous Vide machine out of the deep recesses of my kitchen cabinet, gave it a good dust off, and set it to the optimal egg temperature: 140 degrees Fahrenheit. If you don’t have a sous vide, you can make this recipe with a kitchen thermometer and a few ice cubes. It just requires a little more babysitting. The egg cooks in its shell and when the 45 minutes are up, you simply crack the shell and out comes a perfectly coddled egg with a liquid center and barely set whites. 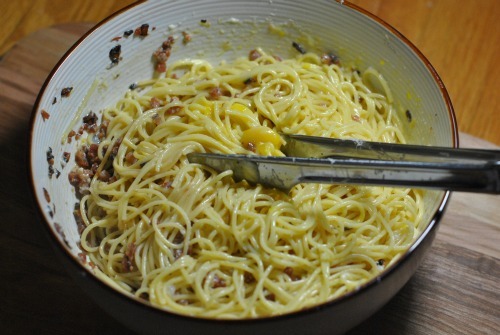 With a quick toss in the pasta, it transforms into the carbonara creamy sauce without any of the scrambled egg fears. If I am a foodie, my father is a gourmand. He lives for these elaborate food projects that take all day. As a busy mom, something has to be really amazing to be worth my time. These eggs are definitely worth the 45 minutes and the effort to organize. Try it and you’ll be thrilled with the fireworks you create. If you dig around the blogosphere, you’ll come up with the Momofuku recipe for eggs (45 minute) and the Thomas Keller recipe for eggs (60 minutes). Go nuts, try them both and let me know which one is your favorite. Set your sous vide to 140 degrees Fahrenheit. Or if you don't have a sous vide, set a large pan to boil with water. Insert a meat thermometer, preferably the kind with a remote sensor, and bring the temperature to 140 degrees. Carefully add your eggs to the sous vide or the pot. 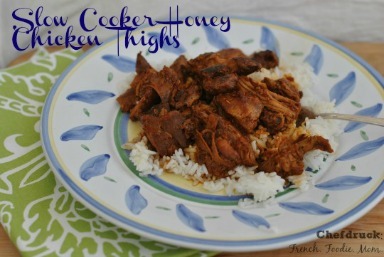 Simmer for 45 minutes. At the 20 minute mark, set your pasta water to boil in a large pasta pot. Measure and cut all of your ingredients. In a large frying pan, cook the onions and bacon. Add the onions and bacon to the bottom of a large pasta bowl. Cook the pasta and add to the onions and bacon. Toss well. Remove the eggs once the 45 minutes are up. Crack into the pasta. Toss well. Add the parmesan cheese and toss again. Serve immediately. You are my hero – so awesome!! The admiration is mutual Liz! You are my healthy hero and inspiration! That egg and the whole dish sound amazing! It is so cool you have a sous vide machine! I love my sous vide machine and I used it obsessively when I got it 2 years ago. Then I forgot all about it and it gathered dust in my cupboard. But thanks to the egg, it is back out and ready to play!